At RoseSlots.com we add new slot games every week for you to enjoy. Here is a quick summary of some of our newest uk slots for you to try on mobile, tablet or laptop. This game is packed with randomly triggered bonuses and free spins features. During the game, if Aztar is on the screen one of four beasts could try to attack him. Then Aztar will battle and kill the beast to activate beast mode. The Magical Crystal Bonus is awarded when three crystal symbols land on reels, 2,3 and 4. The Beast Hunter Free Spins is awarded when 3 free spins symbols land on the reels, this will trigger the beast hunter mode and award 10 free spins. Aztar Fortunes UK slot game is a 96.08% RTP Slot Game with the standard 5 reels and 3 rows format. 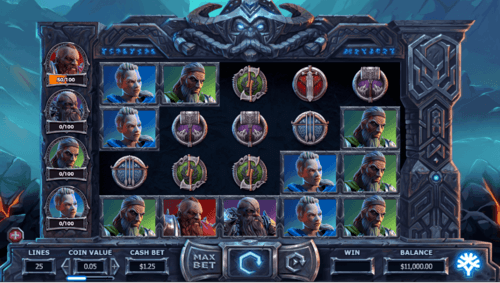 Vikings go to Hell Slot is the latest in the Yggdrasil series of online slot games, following on from the popular Vikings go Beserk and Vikings go Wild. It's no surprise really that a Scandinavian games company such as Yggdrasil (which is the Norse mythical tree of life that connects the nine worlds..) is focusing on this popular theme from their heritage. In this game, the Vikings have gone into the inferno of Hell to fight fierce fire demons. This game isn't just a slot game, its almost a blockbuster movie experience, with it's awesome soundtrack and incredibly rich graphics. This game has Fights and Free Spins. 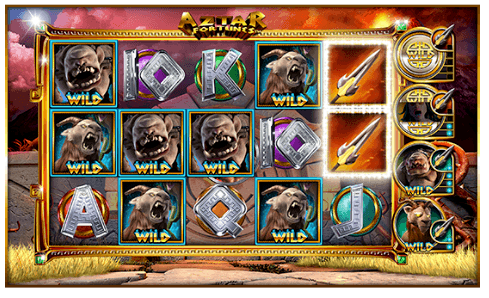 If two free spins symbols land on the board, then the Vikings fight the demons to earn you Rage points and wilds which then also triggers a respin with sticky wilds. Landing 3 Free Spin symbols triggers the feature. The feature starts at Level 1 to defeat the lord of chains. If you manage to defeat him, then you face Lucifer to be rewarded with 3x ALL free spins winnings. On top of this there is also the Treasure chest bonus that lands on the 5th Reel to reveal Good or Epic wins. 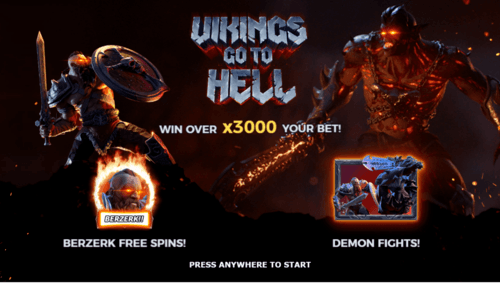 Vikings go to Hell is a 96.1% RTP UK Slot game.